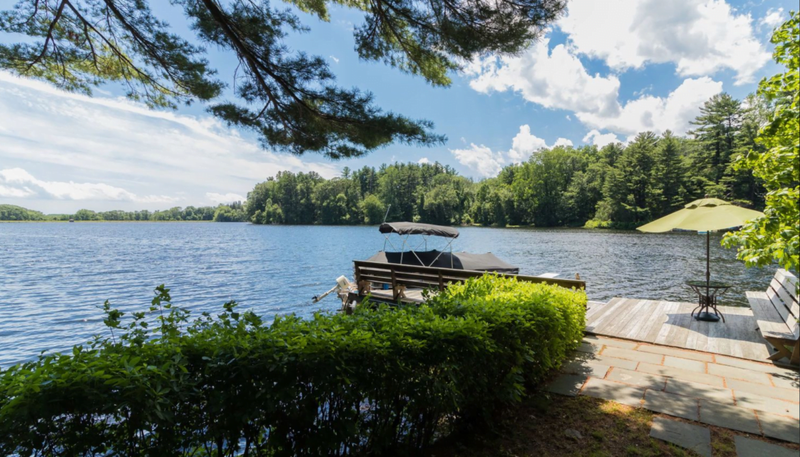 For those who appreciate the relaxing effect of water and are drawn to magnificent water views, and for those who enjoy boating, fishing, swimming, sailing and kayaking any time they like, 961 Beaver Dam Road in Stratford will entice. Presented by Sherri Milkie of William Raveis Real Estate, 961 Beaver Dam Road is set to be auctioned on July 28 at 4:00pm by Concierge Auctions, a leading seller of premium properties worldwide. “We will be selling without reserve, which means we will sell to the highest bidder on July 28,” said Concierge Auctions Project Sales Manager Paulina Kimbel. According to Ms. Milkie, the auctioneer will likely be opening the auction at just $500,000, but there is no minimum bid required. The previous listing price was $2,500,000. To register, bidders simply fill out a registration form, submit a refundable deposit and submit proof of funds in the form of a bank letter. The deadline to register is Wednesday, July 26, but early registration is encouraged. The auction will be conducted on Jul 28, 2017 at 4:00pm. In the auction process, the listing agents, who are honored and respected, are embracing the innovative twist to the sales process and appreciate that they still receive their commission. Ms. Kimbel explained that the no reserve auction requires no minimum bid. “This is the perfect way for buyers to compete in a transparent forum and actually name their price while enabling the seller to obtain a fair market value on the day of their choosing,” she added. Enter 961 Beaver Dam Road through the soaring stone entrance to your very own secluded lakefront oasis. The 6,886 sq ft colonial estate is situated on over five acres, with protected forested parkland and 400 feet of footage on Beaver Dam Lake. Spanning 57+ acres, Beaver Dam Lake, which is crystal clear and 58 feet deep in the middle, is private, with just 28 properties having access. The lake is limited to battery powered and electric boats, which maintains the peaceful quiet. In addition to Sunfish and pontoons, residents enjoy the lake on their paddleboards, sailboats and kayaks. There area three points of access to the lake, including a sandy beach area, an elevated bulkhead and deep water dock with a diving board. Built in 1939, the house has a stone and clapboard exterior, slate roof and copper gutters. Inside, the home boasts five bedrooms, five and a half bathrooms and spectacular lake views from every room on the main floor, as well as a lower level exercise room. The driveway is flanked with two 30 ft stone wall and the circular driveway has a landscaped center island. Just a few of the extra features include an invisible fence for pets, an ADT security system and an irrigation system. As private as it is peaceful, your guests will also relish the scenery and activities this lakefront property affords. Delight family and friends with a boat ride followed by an alfresco meal on the patio, surrounded by maple, birch, and oak trees. The home features gorgeous walnut woodwork and the finest in kitchen and heating technology that will envelop you in effortless luxury. A master sanctuary with his-and-hers spa bathrooms and dressing rooms fit for royalty add a delightful finishing touch. There are open houses scheduled from Tuesday, July 25 through Friday, July 28 from 1:00pm to 4:00pm, or by request. “All of our sales are without contingencies and ‘as is, where is,’ with all due diligence done prior to the auction,” Ms. Kimbel said, adding that the auction is being organized in partnership with Ms. Milkie. Interested parties may call listing agent Sherri Milkie of William Raveis Real Estate at (860) 460-9599 for information on the property, or contact Concierge Auctions Project Sales Manager Paulina Kimbel for auction specific inquiries at (646) 477-1701 or paulina.kimbel@conciergeauctions.com. • Deadline to register is July 26th. Early registration is encouraged. For additional photos click 961 Beaver Dam Road.